Saute the first 4 ingredients in a little bacon fat or lard for 3 minutes until onions are transparent. Add in salt, pepper, Worcestershire sauce and ketchup. Mix well and remove from heat and allow to cool. In a large bowl combine beef and pork and mix well. Add in remaining ingredients along with vegetable mixture and combine well. Form into loaf and place in loaf pan. Form a shallow trough in top of loaf and fill with 1/3C ketchup to make a line down center of meatloaf. Bake in preheated 350° oven for one hour until done. 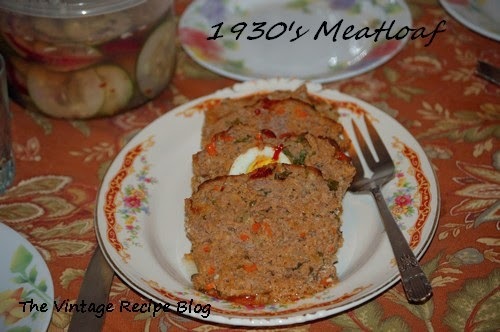 Optional: In the vintage period, meatloaf was ofttimes stuffed with something to add some flavor to it. I don't feel this recipe really needs it as it is flavorful enough already, however I have added dill pickle spears or hard boiled eggs from time to time if I feel so inclined. Just add half the mixture to the loaf pan then a layer in the middle of pickles or eggs then seal with remaining meat mixture.